SHSK girls had a fantastic day, albeit hot and long but their patience was rewarded. They eventually jumped at 8.30pm and just managed to catch the light. 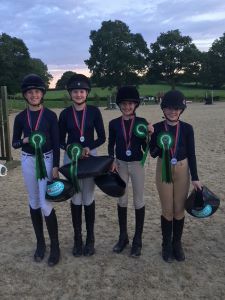 SHSK Team competed in Eventers Challenge National Championships held at Hickstead and the class was enormous with approximately 200 entries. Scarlett Starkey, Zoe Hay, Mia Elvin and Sophie Hardman rode brilliantly and came 4th. Sophie Hardman also competed as an individual in 70cm Eventers Challenge Class and had a super round securing 2nd place.